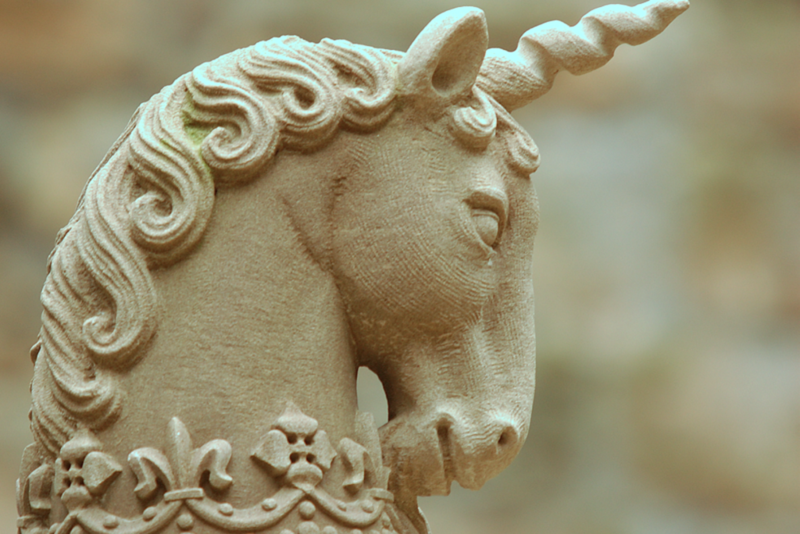 We reveal the best places to spot Scotland’s national animal – the Unicorn! How many will you find? 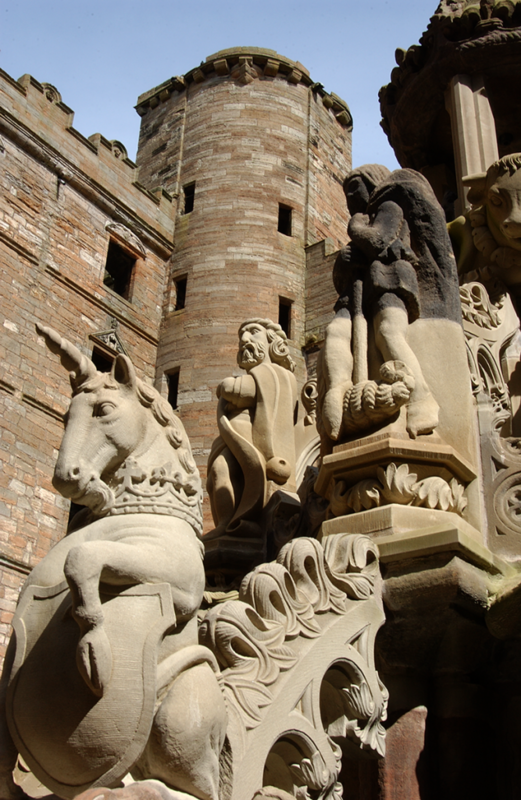 As you visit palaces, castles and sculptured stones around Scotland, you’ll spot these magical creatures in various guises. These shy beasts can be glimpsed in statues, engravings and coats of arms around Scotland. See how many you spot this year, and don’t forget to share your photos with us using the hashtag #HistoricDaysAwait. Let the unicorn adventures begin! Starting in East Lothian, you can see one of the finest surviving market crosses in Scotland. Now at the edge of Prestonpans, Preston Market Cross was once at the heart of the old town of Preston. 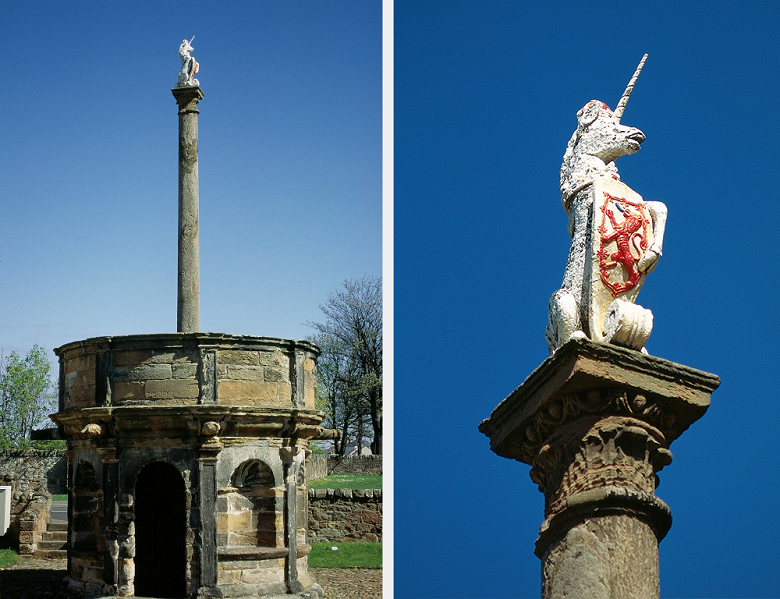 Perched at the top of a 6m tall classical column stands a unicorn, crowned at the throat and supporting a cartouche carved with a lion rampant. The base of the market cross would have served as the town gaol. Explore Aberdeenshire, and come to face to face with a renaissance lord and lady at the beautifully carved Tarves Tomb. The whole tomb is bursting with heraldic imagery and even images of the lord and lady themselves. 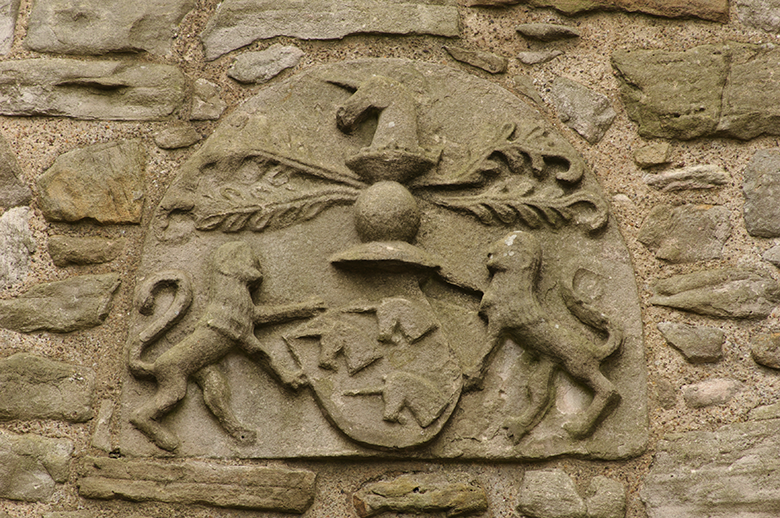 If you look closely you can make out two unicorns on a coat of arms, representing the Preston family from whom the Gordons acquired Tolquhon. 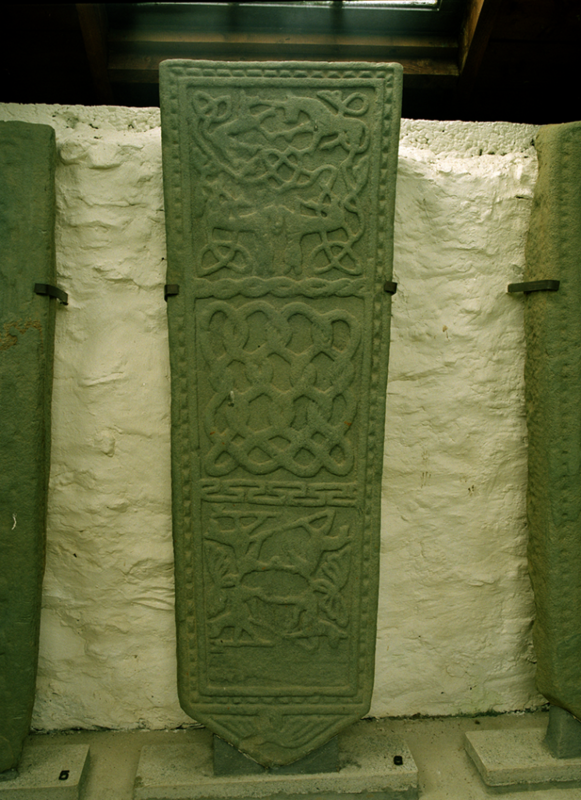 Head to Kilmodan Sculptured Stones where you can visit a collection of finely carved late-medieval graveslabs. These slabs depict a range of animals, both real and fantastic – there’s a deer hunt, animals battling with axes and spears, and a solitary unicorn. Known as Edinburgh’s ‘other castle’, Craigmillar Castle was famously used as a safe haven in 1566 by Mary Queen of Scots. 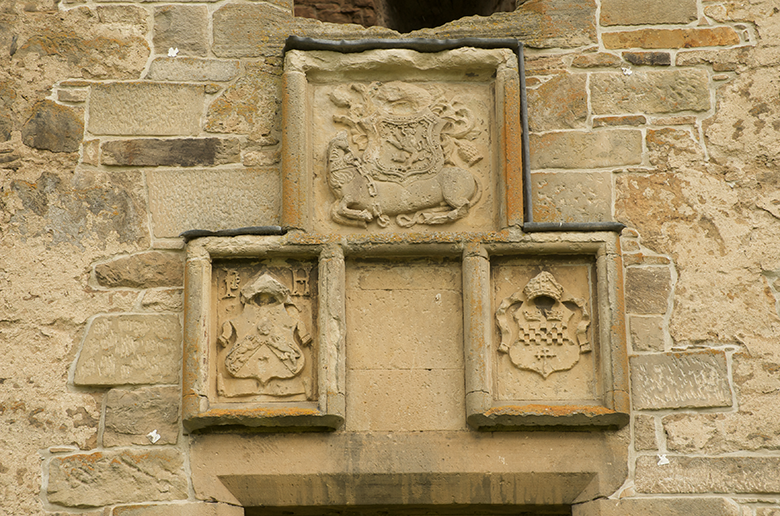 The Preston coat of arms is present around the castle, and it depicts three unicorns. The magnificent ruins of royal ‘pleasure palace’ Linlithgow are perfect for exploring. The royal emblem can be found throughout the palace – see if you can find the unicorns on the ornate fountain, and on ceiling bosses around the palace. 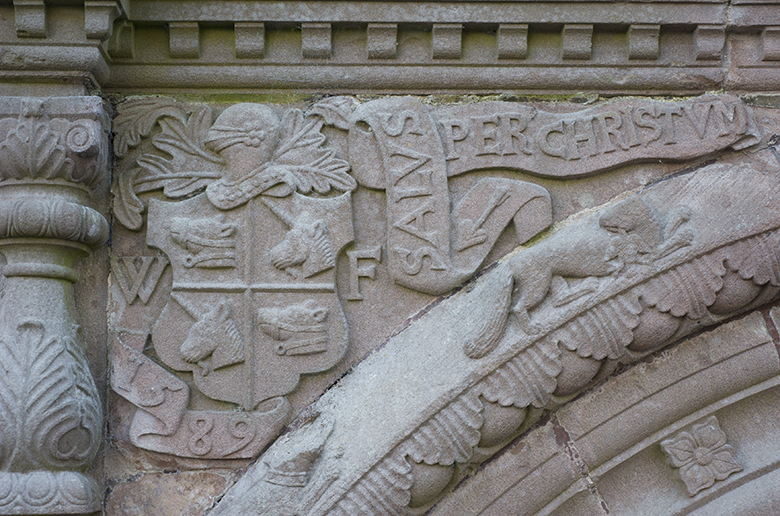 As you spot wildlife and explore the beautiful surroundings of Spynie Palace, see if you can spot the unicorn holding the royal arms. This medieval bishop’s house in the north of Scotland was used as a guesthouse for travelling royalty, and features ‘David’s Tower’- the largest tower house by volume to survive in Scotland. This brings us to the mighty Stirling Castle. 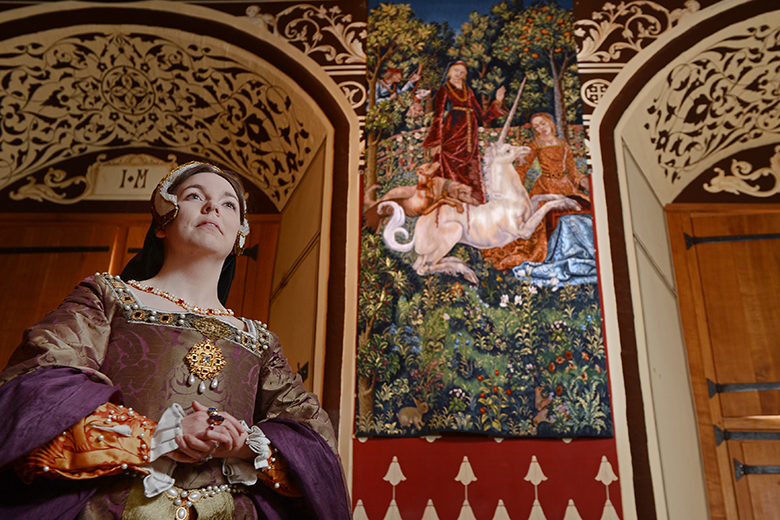 In the Queen’s Inner Hall, you’ll find a set of seven intricate and beautiful hand-woven tapestries. They are closely based on the Hunt of the Unicorn series which were created in the Low Countries in the early 1500s and are now in the Metropolitan Museum of New York at its Cloisters Museum. 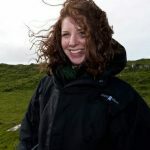 Just visiting Scotland? The best way to get out and spot all of our unicorns is with an Explorer Pass. Live close by? Sign up for Historic Scotland membership. It’s a fantastic value way to visit all of our sites and daytime events for free.